MELBOURNE – Is “quiet” the kind of word you want in a headline about a visit to an open mic? Perhaps. Last night, I was really tempted to go to the fabulous Balaclava Hotel open mic that I attended for the first time last year and where I found an amazing, dynamic, lively and hip atmosphere. But I said to myself, this worldwide open mic adventure – like life itself? – should not be about always going to the same places and doing the same things, but about discovering new things. So I looked up on the various sources what other open mics exist in Melbourne on a Thursday night. I found yet another within a short walking distance of my hotel on Church St. in Richmond, the Station 59 open mic. And I went. And that’s when I found what initially let me down, since the bar was virtually empty when I arrived. I cut out to find a place to eat, and ended up just down the street on Victoria and in the midst of a vast selection of Vietnamese and other Asian restaurants, a street in which, in fact, it seemed “Australian” food had been outlawed. So I settle for a nice big Pho. But I’d spent so much time looking for a non-Asian food restaurant – only because I thought I really ought to try Kangaroo – that I had to gulp down the Pho really phast… and get back to the open mic. Upon returning, I found a colleague/friend from the F1 paddock who had come to meet me at the open mic, his second open mic of one extreme or another (as the previous one had been in a riotous, raucous open mic in Montreal), and a crowd of five spectators. Again I did not despair because, in fact, the audience was fabulous, the reception in the Station 59 was mighty good, and after I spoke to the bartender/manager, I learned that the open mic was far from always being so quiet, that they sometimes had too many people to give a slot to everyone before the open mic finishes at 11 PM. And on top of everything, Cam (for Campbell), the MC, was a fabulous host who made sure the sound system was perfect. So all in all, it was a nice laid back fun night with no stage pressure at Station 59. And ultimately, I was pleased to discover yet another Melbourne open mic, and to see that open mics are so much a part of the culture here that even if the open mic has a few down nights, no one pays any mind – it’s part of the deal…. MELBOURNE – A balaclava may have negative undertones these days, what with the predilection of terrorists to wear these ski masks while taking part in cleansing operations, but Balaclava is also an area in Melbourne, Australia, and the Balaclava Hotel has been host for the last two and a half years to one of the best open mics I’ve ever visited in this Australian city. 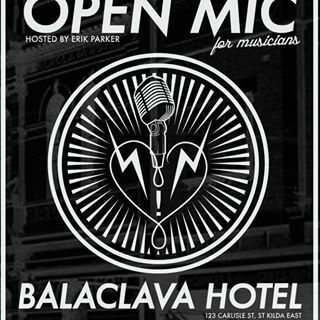 Last night was the first time I attended this Balaclava Hotel open mic, and it was admittedly a busy night, with around 16 performers, but as the genial MC, Erik Parker, told me, next time I want to go I better contact him as early as possible to avoid being nearly last on the list. Still, it only runs until midnight, so being nearly last on the list is no big deal. Last night it gave me the opportunity to see a number of the other amazing performers, including last but not at all least, Erik himself. What was really amusing, though, was that I struck up conversations with a Flemish Belgian who spoke little French, and a couple of French women on a work visit to Australia, and then after that I discovered a Quebecoise and her French-France boyfriend. So the accent on this very Australian open mic was very French last night, as the latter two persuaded me to sing a song in French, and I sang: “Et dans 150 ans,” by Raphaël. At the end of the evening, Erik then dove into his own rendition of a French song, “Je ne regrette rien,” of Edith Piaf – and it was sensational! But most sensational of all is the atmosphere in this vast hotel pub with its bright lighting and sizeable stage for the open mic, at the front entrance to the pub. It is a vast, multi-roomed bar, but it still manages to maintain or create some kind of feeling of coziness and communication between spectators and musicians. And there was a broad cross-section of talents and styles, one of the biggest standouts of the night aside from Erik, being Corey Heuvel, a Canadian on a long visit to Australia. Erik does a great job of organising it, very laid-back and smiling throughout the evening. And he even takes risks to do things he thinks are not possible, like the slot last night in which a full band of five musicians elected to take to the stage…. Really a fabulous evening, great vibe and a place I will definitely return to again next year, if I get back to Melbourne again….